A Trusting Hand, or Is It? In her mystery, suspense, thriller titled, Take My Hand, Margeurite Mooers may as well have glued me to a chair, given me her book and left the room so I could read in peace until I reached the gripping, yet satisfying, conclusion. Detective Chris Bellini had gotten shot and feared it would be the end of his career, as he knew it. Instead, while recovering from his injuries, he was asked to look into a cold case, that of a murdered little boy which had occurred 10 years earlier. He accepted the assignment, not anticipating how much his life would change. I enjoyed the character of Chris Bellini and the relationship he shared with his granddaughter, Amelia, whom he was raising. I could draw parallels between the way he dealt with Amelia and the way I dealt with my two oldest grandchildren, especially when they lived with me - the outings shared, the promises made, the heartfelt connection and the need to protect them from any threat to their safety and peace of mind. I also enjoyed that there was just enough back story provided, at the appropriate times, to allow a necessary glimpse into what had transpired before, without bogging the story down with unnecessary detail. The only problem I had with the story, thus the four star review, was that it needed a better editing job. There was a scattered typo or spacing issue (between characters, not lines) which I could overlook but there were so many question marks missing that, in good conscience, I could not give Take My Hand a five star rating. That being said, I thoroughly enjoyed the story. I was wrapped up in it from the beginning and wondered just how Mooers would tie everything together. I would definitely read other titles by this author. 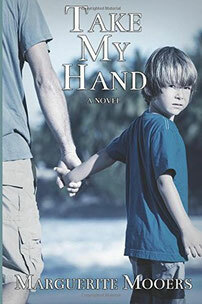 Feel free to visit Take My Hand's page on Amazon to read what others have said about the story.